Mississippi’s pine forests cover over 5.7 million acres from Tennessee to the Gulf of Mexico. These forests provide raw materials for the forest products industry, hunting and fishing opportunities, habitat for endangered species such as the gopher tortoise (Gopherus polyphemus) and red-cockaded woodpecker (Picoides borealis), and other environmental benefits such as soil stabilization, water purification, and carbon sequestration. As important as these forests are, they account for less than 31 percent of Mississippi’s 18.5 million acres of forestland. Hardwood forests and mixed forests of pine and hardwoods comprise the remaining 69 percent of the state’s forestland. Four tree species dominate Mississippi’s pine forests: loblolly pine (Pinus taeda), shortleaf pine (Pinus echinata Mill. ), slash pine (Pinus elliottii Engem. var. elliottii), and longleaf pine (Pinus palustris Mill.). Loblolly pine grows throughout the state except for the Mississippi River bottoms. Because of its abundance and wide range of uses, it is the principal commercial tree species. Shortleaf pine has adapted to a wide variety of conditions and is also found throughout most regions of the state. In natural stands, it is commonly found in association with loblolly pine, with shortleaf dominating the drier sites and ridges and loblolly dominating the moister sites and bottoms. Slash pine naturally occurs in sandy soils typically found in the lower coastal plain; however, it has been widely planted well outside this range. Longleaf pine has the longest needles and largest cones of the southern pines. Longleaf seedlings can remain in a grass stage for many years before initiating height growth. Historically, longleaf and slash provided the major source of naval stores such as turpentine. These four pine species typically comprise two forest types or associations of forest tree species. The loblolly-shortleaf forest type constitutes most of the state’s pine forests, accounting for 4.9 million acres. Other tree species such as sweet gum (Liquidambar styraciflua L.), oaks (Quercus spp. ), and hickories (Carya spp.) are often present in small amounts. The longleaf-slash forest type accounts for 871,000 acres and is found primarily in the lower coastal plain. Various oaks are often present in small amounts, with loblolly pine, sand pine (Pinus clausa V.), bald cypress (Taxodium distichum var. distichum [L.] Rich. ), and pond cypress (Taxodium distichum var. imbricarium [L.] Nutt.) present on wetter sites. The composition of Mississippi’s pine forest has changed over time. Until the early 1800s Mississippi’s forests remained virtually untouched except for limited clearings by homesteaders. After the early 1800s land clearing increased dramatically as public lands were sold at auction. In general, however, the “piney woods” were the least suitable of Mississippi’s forested lands for farming. The soils were relatively poor and quickly depleted, and clearings were often abandoned and quickly reverted back to forest. Thus, by the mid-1800s large expanses of Mississippi’s pine forests were largely intact. However, in the late 1800s and early 1900s the lumber industry moved into Mississippi, with southern pine its primary target. 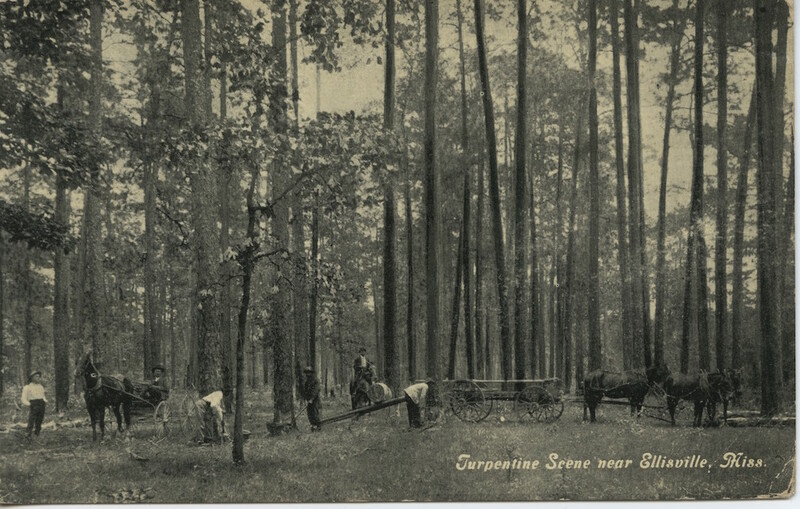 Southern pine became the leading lumber species produced in the United States, and Mississippi briefly was the nation’s leading lumber producer. By the 1930s Mississippi’s pine forests were virtually gone. Most of the cutover land was not suitable for farming and consequently was largely abandoned. The forest did not recuperate until changes in tax laws made it profitable to grow timber, advances occurred in forest fire protection and other aspects of forestry, and a variety of other factors came to bear. Perhaps the major contributor was the forest’s ability to regenerate itself. Loblolly, shortleaf, and to a lesser extent slash pine readily reestablished themselves throughout their range. Longleaf pine, the most majestic of Mississippi’s pines, was not so fortunate. Free-range hogs, wildfires, and the longleaf pine’s intolerance to early competition from other trees and shrubs prevented longleaf from reestablishing itself on most of its former range. Loblolly pine has largely replaced it. Sustainable forestry practices developed after the 1930s have been widely adopted, and Mississippi’s pine forests are some of the world’s most productive. Advances in silviculture (the science of growing trees) have brought another change to Mississippi’s pine forests. Until the early 1950s, most pine stands were naturally regenerated. Since that time, the proportion of pine forests that are planted or otherwise artificially regenerated has continuously increased and now tops 40 percent. Mississippi’s pine forests play a major role in the state’s economy. In 2010 more than 896 million board feet of pine sawlogs, 5.08 million cords of pine pulpwood, and 51 million board feet of poles and pilings were harvested, accounting for 76 percent of the annual timber harvest from Mississippi forestland. Harvested pines generated more than $403,000 in revenues for Mississippi landowners and provided raw material for the state’s pulp mills and sawmills. With sustainable forestry practices and the natural resilience of the native pines, pine forests have the ability to renew themselves indefinitely. Indeed, in many parts of the state and throughout the South, pine forests have been harvested and regenerated several times since the 1800s.